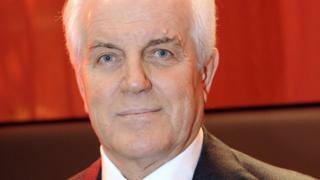 Gilberto Benetton, a co-founder of the Benetton clothing firm, has died at the age of 77 after a short illness. He, with brothers Luciano and Carlo and sister Giuliana, founded United Colors of Benetton in Italy in the 1960s. The family is one of the most powerful in Italy, with interests in construction, transport and catering. Gilberto is credited with diversifying the company away from the clothing business, and growing it into a multi-billion euro giant. He was the former head of the family holding company, Edizione, which controls Italy's biggest infrastructure group Atlantia. A unit of Atlantia operated the bridge in Genoa which collapsed in August, leading to the death of 43 people. His death comes just three months after that of younger brother Carlo in July. He was aged 74. The Benettons also control roadside caterer Autogrill and Rome's airports. The Benetton clothing chain's brightly-coloured sweaters were considered most chic in the 1980s and 1990s and its eye-catching advertisements kept it in the spotlight. An early one featured a black woman breastfeeding a white baby. A later one, labelled "We, On Death Row", used photographs of prisoners sentenced to death in the US. The company continues to provoke. This summer, its advertising featuring images of migrants being rescued from the Mediterranean, was called "despicable" by Italy's interior minister and attacked by the charity, SOS Méditerranée, for using pictures of people "in distress".